Under the theme ‘Bouncing Back-A Bold Belizean Recovery,’ the official budget for the 2017-2018 fiscal year, was presented on Monday, March 13th by Belize’s Prime Minister Right Honourable Dean Barrow. This was Barrow’s 10th budget presentation under the United Democratic Party since 2008. Optimism and commitment for the betterment of the Belizean people and the economy was highlighted during the presentation. Also unveiled was an$80 million tax measure to come in effect in the new fiscal year, starting April 2017. Barrow addressed the National Assembly in the capital city of Belmopan, forecasting an economic turnaround that will coincide with the new budget. 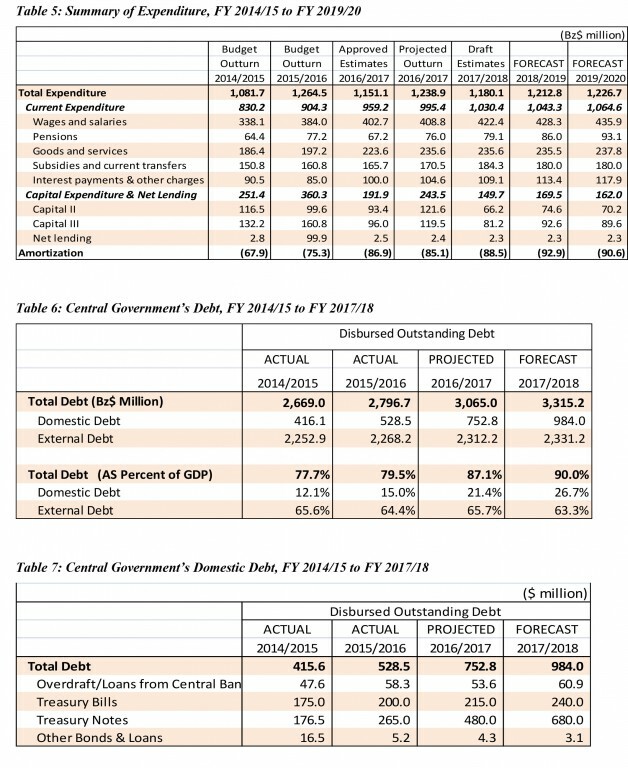 The new fiscal year is scheduled to run from April 1, 2017 to March 31, 2018, and the Government of Belize (GOB) needs an unprecedented BZ$1.033 billion in tax revenues to stay out of deficit. Last year, BZ$937 million was approved by Parliamentarians after being supported by a $50 million tax hike in fuel. This year, fuel is once again being taxed. 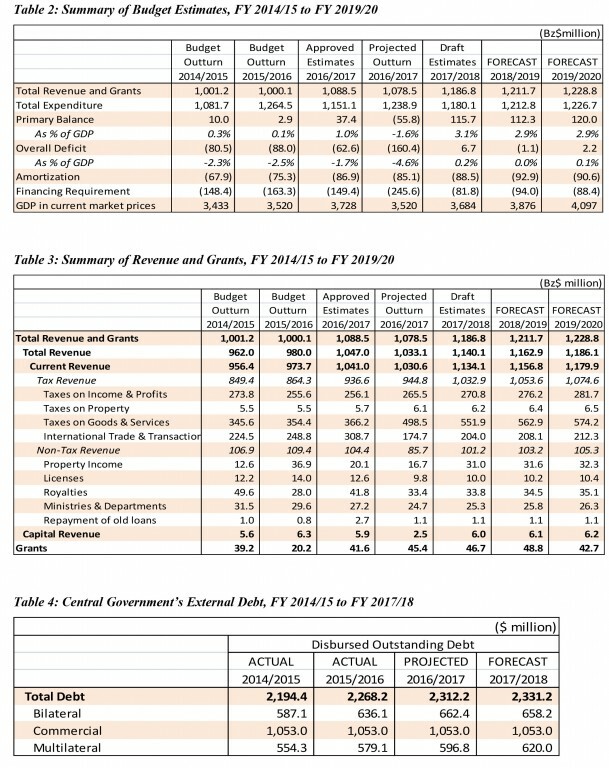 According to Barrow, GOB is planning around 6% less in expenditure, which will amount to about BZ$59 million dollars, while collecting nearly BZ$109 million dollars more in overall revenue than last year. In order to obtain such results, different Ministries will be seeing budget cuts, including Foreign Affairs, Health and the Ministry in Charge of the police. The Ministries of Finance, Housing and Urban Development, along with Education will see an increase of $10 million dollars. Despite the fact that Government still needs additional funds to finance its upcoming budget, Barrow told the media and the country on Monday that economic recovery is underway. “There is clearly going to be a bounce-back in terms of agriculture as we tried to set out, so we are perfectly certain that our projections are legitimate,” said Barrow. With the recent Super Bond restructuring, Barrow’s administration is committed to increase its Gross Domestic Product (GDP) by at least 2% for the next four years, in contrast with the current -1.68% GDP. In order to achieve this and the financing of the year’s budget, taxation was a must. According to GOB, they were careful as to what items to tax so the poor are not affected. During his presentation, Barrow proposed to. “Adjust the excise levy on aerated water, beer, and stout, cement and fuel to generate 0.77% or $28 million of GDP... also amends the departure fee for non-Belizeans to $40 to yield 0.30% of GDP, and a further $15 million from a 1% increase in environmental charge on imported goods. There will also be a shift in the social fee on Free Zone cigarettes to 20%, generating 0.29% of GDP,” detailed Barrow. 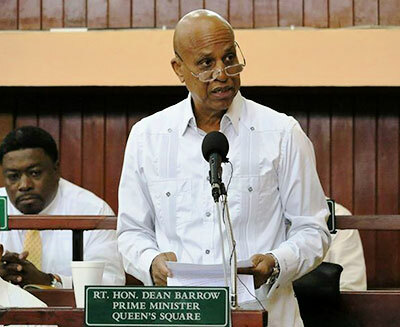 In an attempt to increase revenues for the upcoming year, Barrow referred to the proposals outlined in the General Revenue Appropriation (2017-2018) Bill 2017. It unveiled that Government will also require specified statutory bodies such as the Belize Tourism Board, the National Institute of Culture and History, the Belize Airports Authority and the Public Utilities Commission to contribute 10% of their receipts to GOB’s Consolidated Revenue Fund. Prime Minister Barrow also indicated that this year’s budget will have a financing gap of $261.5 million, which he proposes to meet with $45.1 million in disbursements for loans already contracted with multi-lateral development partners. Another $20 million in budget support comes from the Republic of China (Taiwan) under the on-going bilateral economic cooperation program. There will also be a $20 million draw down of PetroCaribe financing, and $125 million in domestic financing through the issuance of more treasury notes and bonds. GOB is also counting on $55 million from the sale of Government-held shares in Belize Electricity Limited (BEL) and Belize Telemedia Ltd. The Belize Social Security has been allowed to purchase shares in BEL. 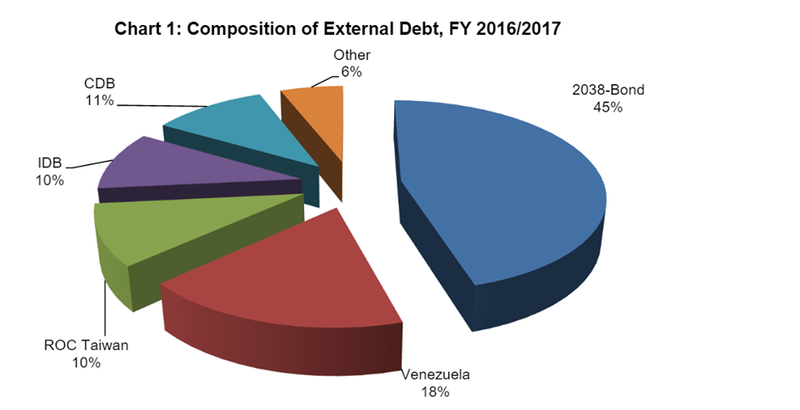 Amid the renegotiation of the Superbond, the national debt is reported at 92% of GDP, or $3 billion, according to Barrow. “At the close of January 2017, external public debt amounted to 70% of GDP, some $2.3 billion, and domestic debt totalled 22% of GDP which is around $750 million,” he said. Barrow also said that in this new budget, eight cents of every dollar the Government collects will go towards debt payments. It is considered a drastic reduction from last year, when 23 cents of every dollar went towards debt. 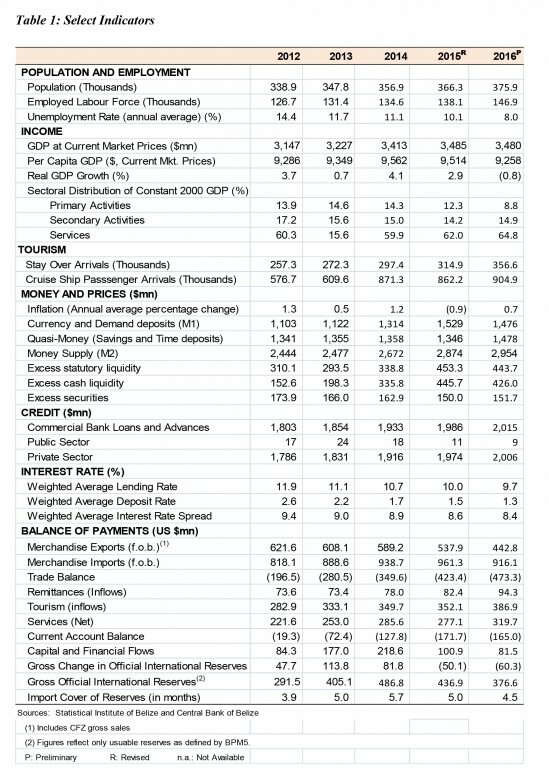 Belize’s debt has seen an increase from last year as well. At the end of 2015, the external public debt stood at $2.3 billion or 66% of GDP. This is attributed at the borrowing to pay compensation to the former shareholders of Belize Telemedia Ltd. However, Prime Minister Barrow remains optimistic, assuring all Belizeans that the investment in the nationalization of companies such as Belize Telemedia and Belize Electricity Limited will more than pay for itself in the years to come. The budget debate will take place on Thursday, March 23rd and Friday, March 24th.